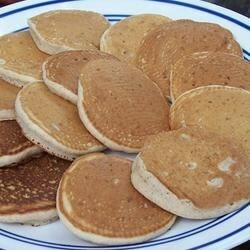 "Pancake mix is blended with soy milk, cinnamon sugar and honey. These pancake bites make everyone who eats them turn into pancake obsessed zombies!" In a medium bowl, mix together the pancake mix, coffee creamer, and cinnamon sugar. Add the water, soy milk, honey and vanilla; mix until just blended, but do not over mix or the pancakes will be tough. Heat a griddle or large skillet over medium heat. Spray with non-stick cooking spray. Use about 2 tablespoons of batter per pancake, and spoon onto the griddle. Cook until bubbles form, then flip and brown on the other side. Hungry for hotcakes? With this premade mix, they’re ready when you are. Great recipe...these are a great breakfast treat! The only problem I found was the soy milk measurements...I had to put alot more than the 1/2 cup. But other than that this was a fabulous idea. The finished product was dry and slightly gritty. I was afraid they were going to be too sweet for breakfast, but they weren't very sweet considering all the sweeteners that are them.